Modest, unassuming, thoughtful, generous. These are just a few of the adjectives that come to mind when one thinks of the late Cuesta Benberry of St. Louis, MO. Equally springing to mind are the descriptive phrases: diligent, thorough researcher; a mind wired for details; a walking, breathing encyclopedia of quilt history. Born 8 September 1923 in Cincinnati, Ohio, Cuesta Benberry’s death Thursday, 23 August, 2007, stunned the quilt world, especially all those who knew her as a personal friend. In spite of their knowledge of her poor health the past two years, her sudden death still came as a shock. Next came the realization that quilt blocks had names. One of the women of the family asked her if she knew of Ladies Art Catalogue. Benberry had never heard of it, but she would never again be so ignorant of quilts and quilt pattern names. A seed had been planted during that Kentucky visit that would blossom and produce one of the great quilt historians of the 20th century. By the late 1950s, Benberry was knee deep in the Round Robins, a popular mode of pattern exchange of the era. Benberry related that she felt she had “lucked out” and was fortunate to find herself in “good Round robins, ones with high standards. 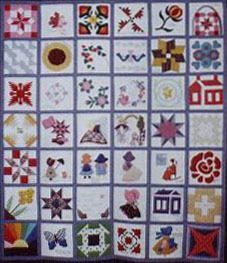 There were rules to be followed and it kept the quality of the exchanges high.” The names that rolled off her tongue were a virtual “Who’s Who” today of early (pre-1970) quilt pattern historians: Mary Schafer (MI); Shirley Conlon (CA); Edna Ford (KY); Delores Hinson (MD); Barbara Banister (MI); Ruth Snyder (KS); Grace Coutant (NY); Mrs. Danner (KS); Joy Craddock (TX); Liz Rushing (LA); Helen Erickson (KS); Carol Lynch (KS); Lena & Livia Moses (VA); Mary Runge (PA); Georgia Williams (MO); Marian James (OR); Frances Noack (M)); Ruby Hinson Duncan (AR); Betty Flack Sumway (IL); Glenna Boyd (OK); Dorothy Marshall (Canada); and slightly later (circa 1970) personal pattern exchanges with Sally Goodspeed (MD); Barbara Brackman (KS); Maxine Teele (IA); Wilma Smith (OR); Wilene Smith (KS); and Carol Crabb. A regular series in Nimble Needles Treasures (1969-1975, Patricia Almy Randolph, Editor) was titled "Quilting from California" (or Canada, Hawaii, Iowa, Kansas etc) showing the breadth of coverage in NNT in those early years of the late 20th century quilting renaissance. Benberry published her first article "Stitched in Time Comes to St. Louis" in the pages of NNT in June 1970. In an article about Randolph and NNT by Hazel Carter in the Spring 2000 issue of the newsletter of The Quilters Hall of Fame, Randolph states, "My association with Cuesta Benberry was the backbone of NNT historically and it would not have been the same without her." The article goes on to say that in the pages of NNT Benberry exposed quilters to "first-ever-in-print news about Ladies Art Co.," as well as a chronological study of quilt kits, the Smithsonian quilt collection, and the Index of American Design at the National Gallery of American Art. This was all new territory in the history of quilting and Cuesta Benberry was blazing the path. In fact, it was in the pages of NNT that Benberry’s first quilt history article was published. When that publication ceased Bonnie Leman of Quilters Newsletter Magazine invited Benberry to write for QNM. Twenty-four years later serious scholarly quilt research is enjoying the greatest boom ever in its history. Cuesta Benberry is without a doubt one of its outstanding pioneers. She will be greatly missed by all who knew and loved her.